Revenue in the Books, Movies, Music & Games segment amounts to US$99,964m in 2019. Revenue is expected to show an annual growth rate (CAGR 2019-2023) of 2.2%, resulting in a market volume of US$108,966m by 2023. 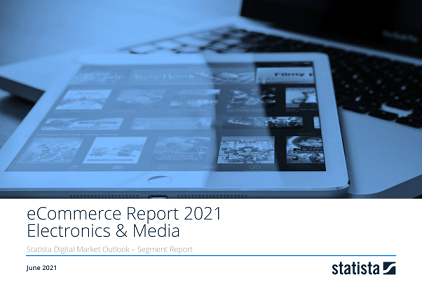 User penetration is 21.2% in 2019 and is expected to hit 30.2% by 2023. The average revenue per user (ARPU) currently amounts to US$64.04. In global comparison, most revenue is generated in United States (US$33,166m in 2019). The eCommerce market segment Books, Movies, Music & Games covers the sale of physical media, for example books, DVDs, CDs, Blu-ray discs and computer/console games via a digital channel. However, digital media that are purchased as a download or via a subscription to a streaming service is part of a separate segment (see: Digital Media). One of the most important providers in the market segment Books, Movies, Music & Games is the US Internet-based retailer amazon.com. All monetary figures refer to the annual gross revenue and do not factor in shipping costs. Reading Support Revenue in the Books, Movies, Music & Games segment amounts to US$99,964m in 2019. Reading Support The Books, Movies, Music & Games segment is expected to show a revenue growth of 2.1% in 2020. Reading Support In the Books, Movies, Music & Games segment, the number of users is expected to amount to 2,310.6m by 2023. Reading Support User penetration in the Books, Movies, Music & Games segment is at 21.2% in 2019. Reading Support The average revenue per user (ARPU) in the Books, Movies, Music & Games segment amounts to US$64.04 in 2019. Reading Support In the year 2017 a share of 31.3% of users is 25-34 years old. Reading Support In the year 2017 a share of 50.7% of users is male. Reading Support In the year 2017 a share of 40.8% of users is in the high income group. Reading Support With a market volume of US$33,166m in 2019, most revenue is generated in United States. Reading Support With a rate of 56.1%, the user penetration in the Books, Movies, Music & Games segment is highest in United Kingdom. Here you can find more studies and statistics about "Books, Movies, Music & Games".